Sunday: Rain develops. Highs in the 30s and 40s. Sunday Night: Rainy, mild. Temperatures in the 30s and 40s. Monday: Clearing out, windy. Temperatures dropping into the 20s and 30s. Not only is it a showdown in Minneapolis with the Patriots taking on the Eagles for the Super Bowl on Sunday, but it’s also a showdown between the warmer air versus the colder air that settled over the region Saturday. It was a cloudy and warmer start to our Sunday, compared to Saturday’s bright and frigid start. A few flurries have popped up in parts of New Hampshire and Maine at this point and the wind has started to pick up out of the SSW at 10-15 MPH with some gusts up to 30 MPH. Winds are expected to climb, along with the temperatures, as high temperatures will reach into the lower 40s for Boston and Providence as early as noon. Areas farther inland and higher terrain will be in the mid to upper 30s for highs, with lower 30s along the Canadian border. With the system sliding in, warmer air slides in by midday, making most of the precipitation falling as rain for most of southern New England, with a spot mix for the higher terrain in the Berkshires and the Worcester Hills. However, a Winter Weather Advisory has been posted along the spine of the Green Mountains of Vermont, northern New Hampshire, and northwestern Maine in anticipation of at least several inches of snowfall in those locations. The advisory is in effect through Monday morning. There is also a Wind Advisory posted for Downeast Maine through midnight tonight, with gusts upwards of 45 mph possible, meaning we could see some minor power outages there. As far as timing of the system Sunday for your Super Bowl travels, rain overspreads southern New England between 4 to 6 p.m. this evening, with the rain/snow line just north of an imaginary line from Bangor, Maine to Concord, New Hampshire to the Massachusetts/Vermont state line. So, most of Vermont, northern New Hampshire and northern Maine will deal with the snow showers through this evening before winding down after midnight tonight. However, as the snow showers start to simmer, the rain showers in southern New England start to ramp up. Between 9 to 11 p.m. we could see pockets of heavier downpours, along the immediate coastline of New England and the rain/snow line continues to retreat northward, giving way to a changeover from snow to rain for most of Maine and New Hampshire. Drier and colder conditions start to slide in as the system exits the region from west to east through Monday morning with some scattered snow showers developing along the higher terrain for Vermont, NW Massachusetts, and northern New Hampshire. In total, 3-6 inches are expected for areas closest to the Canadian border and along the higher elevations of the Green Mountains in Vermont, with some locally higher amounts up to 7 inches. One to three inches of snow is expected along and north from the Massachusetts/Vermont state line to Manchester, New Hampshire, to Lewiston, Maine. Colder air settles in for Monday and Tuesday with highs into the low to mid 30s south, and low to mid 20s north. Wednesday brings our next system with a mixed bag of precipitation and could make for a slick morning commute both Wednesday and early Thursday morning. 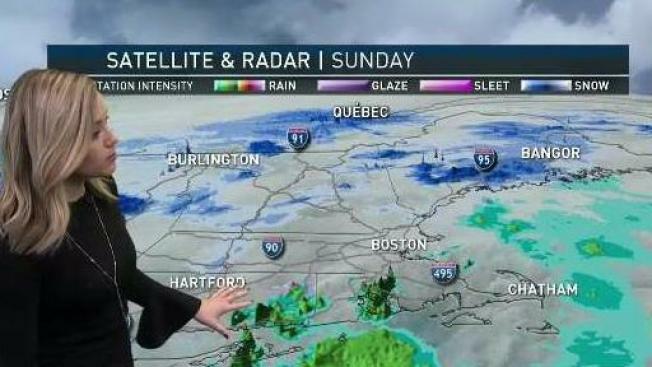 Stick with NECN and NBC10 Boston on the air, online, and on-the-go with the app for the very latest updates to your forecast. In the meantime, we hope everyone has a fun and safe Super Bowl Sunday.